Whether you are an empty nester downsizing to a smaller home, or a growing family selling their starter home and moving into a larger space, there are a few things you can do to increase the value of the sale of your home. In the past buyers have seen homes as pallets upon which to paint their own picture, but more and more of today’s buyers want a home that is walk-in ready. According to Doug Young, owner of City Tile, a new floor or backsplash can mean the difference between selling your home for $300,000 or $$335,000. Kitchens and baths sell homes, as do hardwood floors that are easy care. As a matter of fact, in this go-go world of ours, buyers want homes simple to maintain while being warm and inviting. Bathrooms Are Big. For the last several years the top item for a bathroom remodel was a large walk-in shower with luxury mosaic design. While there is still interest in large showers, the trend is changing according to Angie’s list. Freestanding soaker tubs are taking the place of large glass door showers. Beige stone-look tiles are being replaced by shades of gray and black. The look and feel of early 20th century bathrooms with small black and white hexagonal tiles with oversized art-piece tubs is a rising trend in remodeled period homes and some new construction. Kitchens Shine. 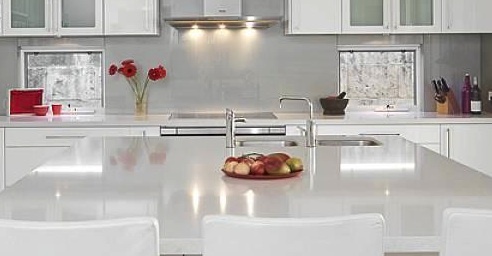 According to Angie’s list, the rumors of stainless steel appliances being passé are vastly over stated. New stainless appliances paired with a large farm sink will get your kitchen noticed. While some of these sinks are porcelain, many are stainless, stone or copper. Add a small grey glass subway tile back splash, and a granite countertop to give your home the most up to date styling. City Tile has a vast supply of kitchen flooring to add polish to any kitchen update. Ecologically Sound. Today’s discerning buyer wants a home that has been updated with earth-friendly materials, like Mannington’s LEED certified laminate flooring. Sustainable materials can also be found in other products like carpeting and tile. There are low VOC versions of tile adhesive, grout and grout sealer. But of course the ultimate in sustainability is reusing what is old and giving it a new life. Textured accent walls are all the rage, the most trendy being a repurposed barn wood wall. Lighten the Load. Especially in small homes, an open floor plan can make a house look larger. If you don’t have the desire to knock down a wall to sell your home, there are ways to make a small home (or any home) look larger. Remodelista recently shared a few designer tips. First, they suggest you “scale it down.” Make sure furnishings don’t overwhelm the space. Keep them small and simple. Second, they say to keep things low on the walls. This will make the rooms feel taller. Third, get rid of drapes and rugs. These add weight. If you want window coverings, keep them light and airy. Fourth, paint the interior of the house white. It blurs space and moves the eye from room to room seamlessly. Lastly, leave open space. Create a visual emphasis, an obvious path through the room, a vertical focus or a horizontal focus. But, whatever you do, keep it simple. Make It Tidy. If you have some lead-time before you sell, do tidying and purging before you move into your new home. As you are packing up boxes of your possessions, purge those times that do not bring you and your family joy. This is the time to decide what to keep, sell, donate or discard. If those boxes in the attic have never been opened in the years you have lived in your current home, get rid of them now. This will help you get rid of clutter before showing your home, which is another way to make your home look larger and more inviting. Whether you invest some money into remodeling a kitchen or bath to increase the sale price of your home, or simply give it an updated and airy feel, the key is to give it a feel of new life. Make sure your home is well maintained, clean and clutter free. Fill it with only those items that bring you joy, and that joy will be felt by potential buyers. They will want to make your old home their new home.